You conduct a "getting to know you" activity in your classroom that first day or week and what do you do with it? Do you hang it up for open house or send home with their graded papers? Let's take a minute to delve into the hearts and minds of our students and use it to our advantage. Let's start by asking the right questions and getting the most with this information. You’ll find out the interests, values, and experiences of each student. Then it's our job to take those interests and experiences and run with them! Take advantage of this information, if you're asking the right questions, this could be very valuable! These questions give our students a voice and a say so to speak in their education. They're telling us information that we could use for future lessons or motivation. We just need to listen carefully. Everything you need to know at your fingertips! And, all from your students...making this information valuable! By asking these personal questions in a "fun" format I can show I care by acting upon their answers. For example, if they choose soccer as an outdoor activity they like or sport they play, I can choose reading materials for him/her based on this interest. I can create a science or math lesson geared around soccer and allow them to be the "helper or expert". I will be teaching, building community, and student self-esteem all at the same time. Another example, maybe they choose "math" as their least favorite subject. I'll need to find out right away why my student doesn't like math. Is it because they don't know their multiplication facts, parents don't like math, get anxious during math? I could offer some one on one help before or after school or send home a fun math sheet or website to get my student turned around and loving math! THESE ARE OPPORTUNITIES! Read all of the recording sheets, let your students share their voice, and be a part of the way you start your year! I've created a list of questions I feel will get us some really helpful information about our kids. They are quick questions for students to answer and I designed them in a Scoot Game! Fun for everyone! I thought this would be perfect since my students love Scoot! I could introduce them to this game and complete my getting to know you activity at the same time! Did I mention this is a FREE resource??!! That's how excited I am about you using these questions to learn more about your students and using the information to make your classroom the BEST it can be! :) xoxo Click here to get this resource. I'd love to hear your thoughts about this post. Thank you, this is awesome! Downloaded and ready to print! 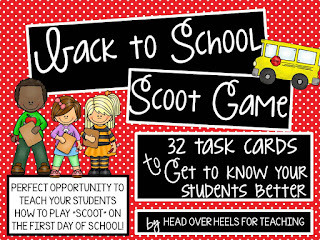 Scoot is such a great way to get students up and moving while keeping them engaged. I love the idea of a "getting to know you" scoot. So much information to be gained. Thanks so much for sharing!